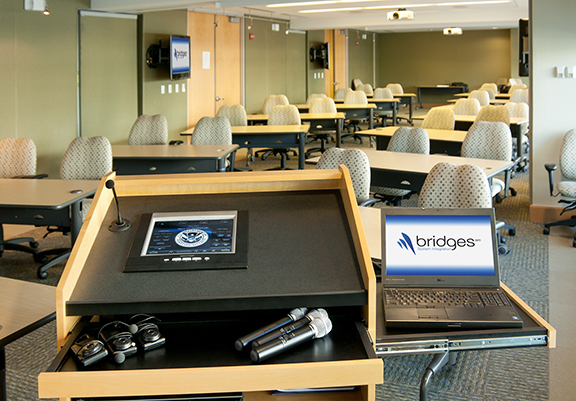 The Department of Homeland Security, Office of Chief Human Capital Officer (CHCO), engaged the Bridges SI team to address their aging divisible training rooms. The facility featured three spaces with two air walls. CHCO objectives for the space included a physical makeover and a refresh of technology enhancing capabilities and reducing the labor necessary for classroom set-up. The Shape practice met with CHCO stakeholders establishing the interior design priorities for their divisible space. After completing a needs-assessment and a review of the project budget and priorities, it was determined that much of the existing furniture could be reutilized. Overall the room needed a simple facelift to project a clean, light new space, while at the same time adhering to a limited budget balancing multiple priorities. 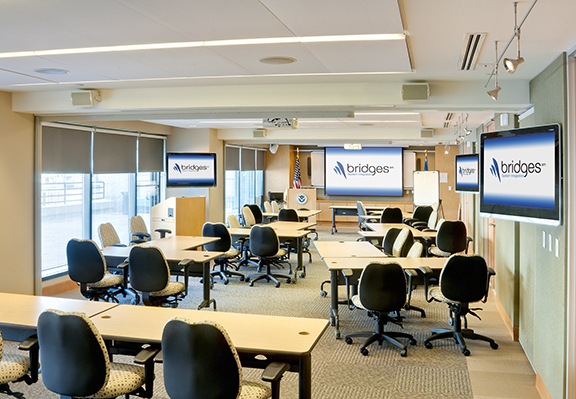 Bridges SI worked with the client selecting new carpet tile that was designed to withstand the rigors of heavy traffic and featured a pattern conveying a modern, appealing space. Additionally, the Shape practice specified and installed window shades to complement the new look. The combination of carpet, shades and new paint resulted in the warm inviting facility CHCO was striving for. The Bridges SI team observed CHCO meetings to gain a better understanding of how the spaces were used and then met with stakeholders to document their goals and challenges with the existing system. The primary objection with the facility was the myriad of cables that each room required to present on the audiovisual equipment. When the rooms were joined, the signals were manually patched. This created numerous issues including aesthetics, function and capabilities. The Construct practice determined an automated system based a large digital matrix switcher was the proper solution. Furthermore, in an effort to address their cable management issues, our team provided lecterns enabling each presenter to control their individual space, or when combined, the entire facility. 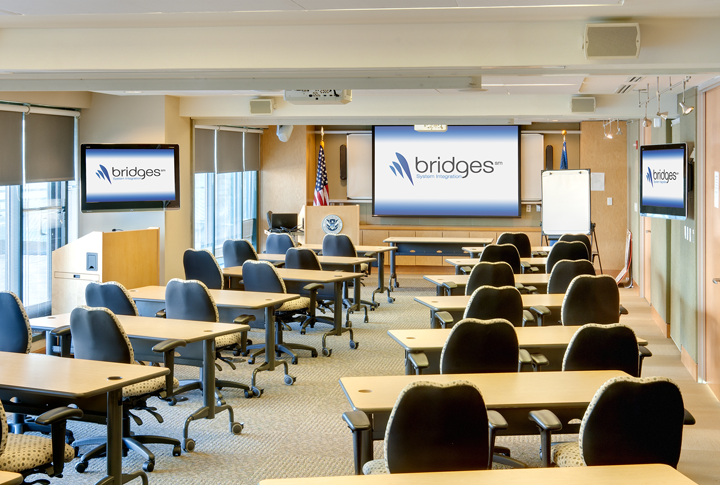 Each of the three spaces comprising the large training center features a large, front-projection system for the primary display, and includes a flat-panel for supplemental display. The rooms have the ability to show unique information, or in a combined mode with the air walls open, the audiovisual system can share the information across all displays. To maximize room flexibility, ceiling microphones were specified and installed. The ceiling microphones allow both the presenter and the participants to be heard through an integrated audio conferencing system. Additionally, the presenter has wireless microphones that feed any of the room combinations and the audio conferencing system. The facility now has the versatility and the simplicity to allow the staff to engage with the participants, not the technology. With possible sources including multiple laptops, satellite and physical media, the material can be as varied as necessary to effectively convey their message. As government agencies continue to feel pressure to increase telework and reduce their footprint, savvy agencies are turning to technology to provide employee engagement off-campus. 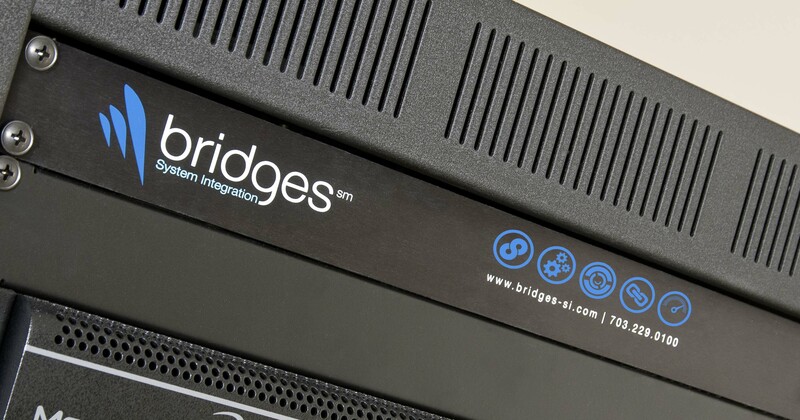 The Unify practice at Bridges SI developed an enterprise video distribution system with CHCO enabling materials and presentations to be available for off-site employees. The solution allows for computer and video content to be digitally stored and cataloged. CHCO can distribute the content to any audience they choose either by streaming the content or through providing media. The Unify practice continues to work with CHCO to find more effective ways to reach larger audiences with reduced resources. Previous to the Bridges SI engagement, CHCO’s conference facilities did not have a maintenance contract. Typical in this scenario, the audiovisual was in disrepair before our team began the project. Out of the three projectors, only one presented an image and each flat-panel had significant issues. Presently, CHCO has engaged the Sustain practice to provide operational support for large meetings, preventative maintenance, as well as an enterprise case-management system. This system allows CHCO to generate and manage cases with the objective of maximizing uptime and leveraging their investment to system’s potential.